The Abyssinian Crisis of 1935 prompted the dispatch of a British force to Egypt in order to protect any possible threat against British interests there. On 7th January 1936 2nd Battalion, The Gloucestershire Regiment left Southampton and arrived at Alexandria nine days later. By the 24th January the battalion, which was due to convert to a Machine Gun Battalion at the end of the year, was at Mersa Matruh near the border with Libya, which was part of Fascist Italy’s North African empire. From the British Army’s point of view this was a period of very tight budgets. Military hardware, armoured vehicles, transport and ammunition were in short supply, and the training regimes reflected this. Emphasis was placed on physical fitness, toughness, and the development of team spirit by playing robust games. “. . . Catterick Camp, 31 Dec. ’35. . . . All Regimental and personal arrangements have of course been thoroughly upset. The prospect of success of the Rugby and Boxing Teams appeared so very good. The former would no doubt have gone a long way in the Army Rugby Cup, while the latter would have won the Northern Command Boxing Championship without a doubt, and had they not won the competition, would have done extremely well in the Army Inter-Unit. “. . . Sidi Bishr Camp, 5 Feb. ’36. . . . We are doing our best to get games going, but are severely handicapped. We have a patch of sand as a football ground with the other Units in camp and have ourselves acquired another some distance away. The main grounds of Alexandria are of course many miles away. “. . . Mersa Matruh, 1 March ’36. . . . We have temporarily organised the Battalion as a Machine Gun Unit, and Bill Walton’s Company is the only Rifle Company. Sharpe’s company has the Anti-Tank guns, while King and Biddulph each have a Machine Gun Company of two platoons. This re-organization is not on account of our new role as a Machine Gun Battalion, but owing to the large number of weapons we have to man with very small numbers. The new Chief of the Imperial General Staff has been visiting our dust heap and though he may have thought much, failed to say anything. “. . . We are managing to get some good games of Rugger with other units, and we are hoping to have a good swimming and water polo team. “. . . Western Desert, 31 March ’36. . . Life continues much the same in our dust-heap-by-the-sea. It is enlivened from time to time by unfounded rumours of our return to that pleasant little island we left in January. “The daily dust storms continue and take a great deal of getting used to. “The monotony of existence was enlivened last week when we took part in a three days exercise in the desert with the Mobile Force, known locally to the irreverent as the Mobile “farce”. “In all, we covered about 200 miles of the most unbelievable “going”. The operations were thoroughly naval in aspect. It was an interesting sight to see the Battalion in lorries extended over an area of about one square mile; the Colonel acting as High Admiral, with Walton, Sharpe as his Admirals of the Red and Blue, respectively, well to his left and right, they themselves again followed by King and Biddulph, leading their fleets, on the horizon in the rear. The threat of an Italian invasion or an Egyptian uprising having dissipated, the battalion left for England on 22nd December. The question remained, had the posting been a monumental waste of time? Certainly, for 2nd Battalion, The Gloucestershire Regiment, the return home brought with it the much desired success on the rugby field, as the battalion went on to win the Rugby Army Cup in 1938, for the first time since 1910, and were to be runners-up the following year. The official conversion of 2nd Battalion to a Machine Gun Battalion was carried out on the return home, but they had already reverted to being an infantry battalion before the Second World War broke out. 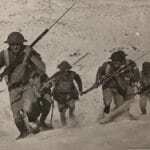 But their desert training was not to be put to any practical use, for no infantry battalion of the Regiment was to serve in North Africa during Second World War. However, in 1937 the third of the trio of British armoured warfare visionaries who hovered on the fringes of the military establishment between the wars, Major-General Percy Hobart, took over command of the so-called “Immobile Farce” and turned it into the instrument that would destroy Italian ambitions in North Africa in 1940-41, and evolve into the nucleus of the army which would go on to defeat Rommel’s Afrika Korps. “Above all, the British Regular Army in the 1930s offered opportunity for sport – football, both soccer and rugger, hockey, cricket, swimming if the station was by the sea, shooting, running, and for the cavalry regiments riding, or perhaps learning to drive a motor vehicle, an accomplishment not, in those days, quite so common as it has since become. Many people have judged that the British Army’s dedication to sport was at the expense of professionalism, but any lack of military efficiency in the late 1930s was due as much to lack of equipment as to any other factor. The Army would willingly have trained with tanks and guns had they unavailable; in 1939, the anti-tank guns of at least one regular battalion in England were still represented on exercises by green and white flags.